A seal was spotted on Sasco Beach in Fairfield on March 27, 2019. 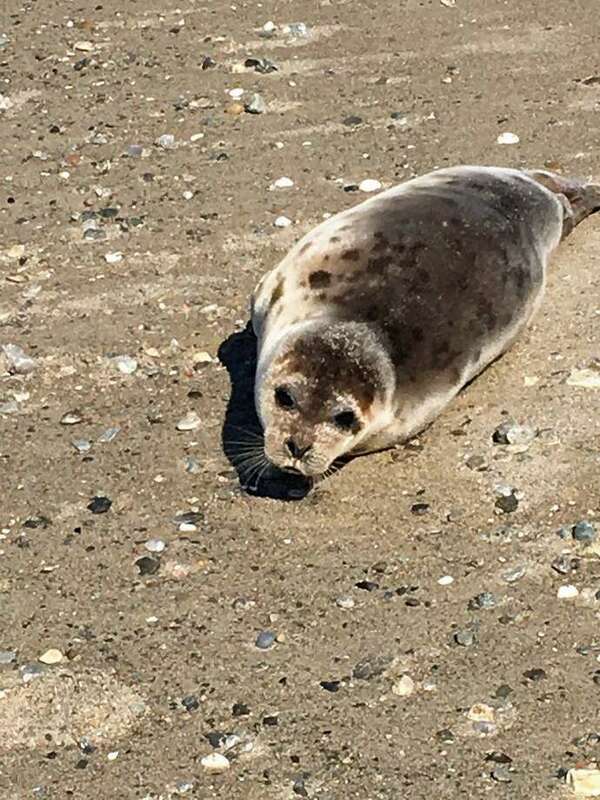 FAIRFIELD — Fairfield Animal Control responded around 11 a.m. Wednesday to a report of a harp seal — who decided to soak up some sun — on Sasco Beach. Mystic Aquarium and the state’s Department of Energy and Environmental Protection were called to the scene, said Animal Control Officer Paul Miller. The marine creature plunged back into the icy waters at around 2 p.m., said Dale Wolbrink, a representative from Mystic Aquarium. Miller, who has been on the job for 30 years, said he has seen seals come out of the water about seven times throughout his tenure and he assured that other officers have seen seals, too. Fairfield police received pictures of the seal at around 11 a.m.
“Looks like it’s just sunning,” Kalamaras said when he received a picture of the seal from Animal Control Wednesday morning.